A delegation of protesting candidates led by Shri Manoj Tiwari, Hon’ble Member of Parliament met with the undersigned today at about 1.00 PM and handed over a fresh Memorandum demanding a CBI enquiry into the allegations of leakage of questions of the Combined Graduate Level (Tier-II) Examination 2017 held from 17.2.2018 to 22.2.2018 etc. 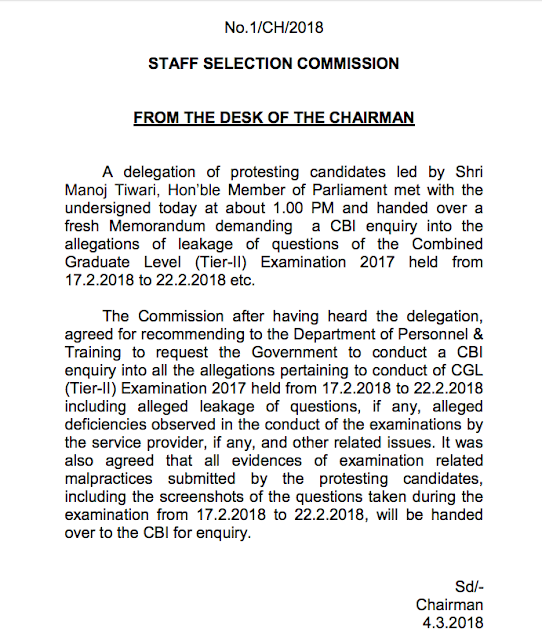 The Commission after having heard the delegation, agreed for recommending to the Department of Personnel & Training to request the Government to conduct a CBI enquiry into all the allegations pertaining to conduct of CGL (Tier-II) Examination 2017 held from 17.2.2018 to 22.2.2018 including alleged leakage of questions, if any, alleged deficiencies observed in the conduct of the examinations by the service provider, if any, and other related issues. It was also agreed that all evidences of examination related malpractices submitted by the protesting candidates, including the screenshots of the questions taken during the examination from 17.2.2018 to 22.2.2018, will be handed over to the CBI for enquiry.